I colored Tilda with Copics and distress inks. I added Stickles to the tree. I was very drawn to the purple in the inspiration picture. I had a bit of a challenge finding the right paper, but settled on background paper that featured purples, blues and greens. I used white core paper, dry embossed with my embossing folder, and sanded off the blue with my sanding block to reveal the snowflakes. I used acrylic paint and crackle medium over the entire box. I lined the inside of the box with felt. I covered the sides of the box with this lovely lace. The feet are Tim Holtz Hitch Fasteners. I hand-drew some extra rocks on the wall. I will be entering this in the Magnolia-licious Highlites Chalenge. I really enjoyed this project and have found the boxes to make many more. I printed the cardinal and the sentiment on ink jet transparency. I then embossed it with clear embossing powder. I then colored the image with Copics (which worked because of the embossing). I wanted to add feathers for the cardinal, and came across these really fun polka-dot feathers in a mardi gras pack. I used the sketch from the Midnight Madness challenge. I have to admit, this card was a bit of a stretch for me. It was more masculine than I usually create, lacking the flowers and foofoo. However, I really love the result. It's Thanksgiving in the US and it is time for another Cute Card Thursday Challenge. Our challenge this week is called Blast From the Past. We are choosing from the previous challenges. 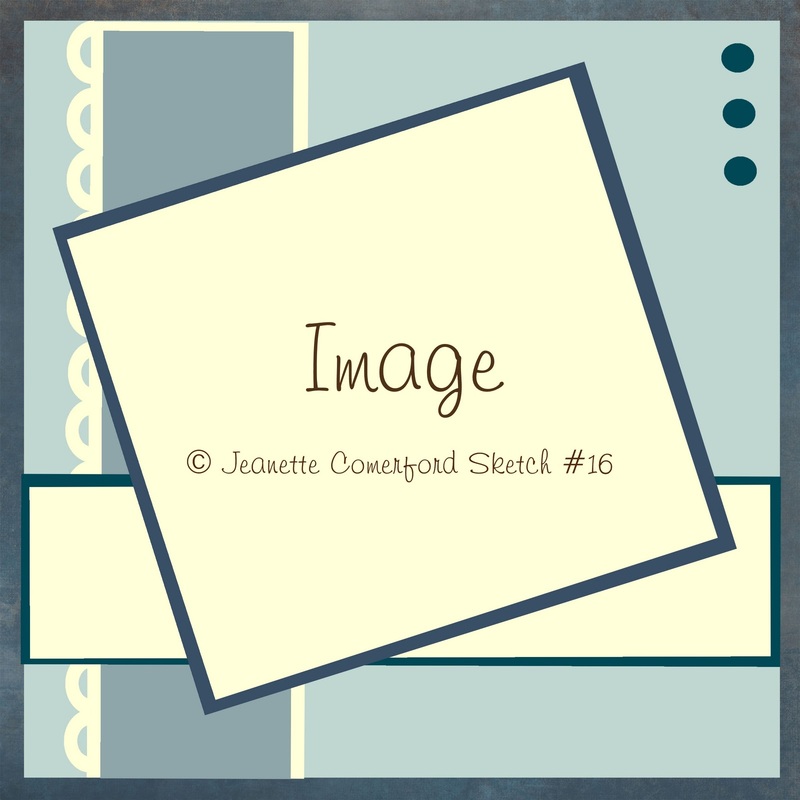 I love sketches, and I wanted to go way back, so I chose the sketch from May 20, 2008, challenge #11. For all my blogging friends in the US, Happy Thanksgiving, and to all my blogging friends around the world, have a fabulous day! It's time for another 7 Kids College Fund Challenge! 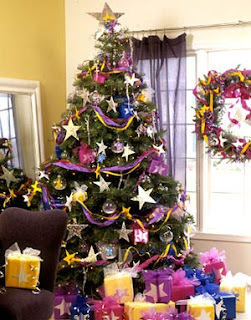 Our challenge this week is Nontraditional Christmas Colors! Make a card or projecting using anything but red and green. I used a combination of Copics and Distress Inks to color this darling image! This gorgeous image called Christmas Tagis a digital image from Sugar Creek Hollow. I colors the image with distress inks and used my Copics Airbrush System to color the sky. I added some Stickles to the snow to make it sparkle. I also used my Copics Airbrush System to color the flowers. 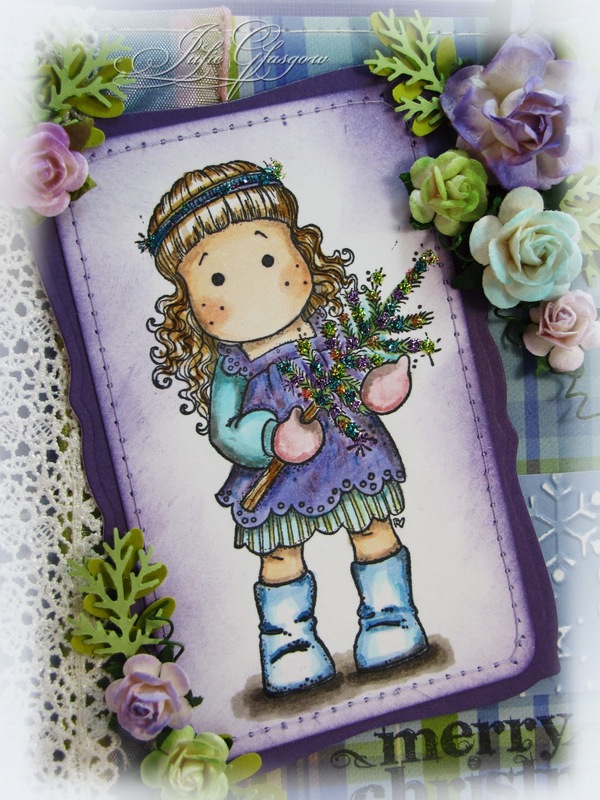 This adorable Tilda is available at 7 Kids College Fund: Go see the great selection of stamping/scrap-booking supplies available. See you tomorrow for another Cute Card Thursday Challenge. This week at Sugar Creek Hollow, we were challenged to use a stamp that has not yet been used, which is really difficult as the stamps are so adorable, they have all been used. Then, this week we were surprised with a new stamp, and you are going to love it! 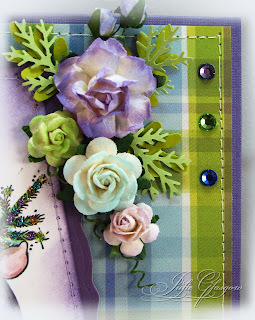 Accessories: Spellbinders Fancy Tags, Tim Holtz Elegant Flourishes, Tattered Florals Tim Holtz Alterations Die, Music from a hymnal, Tim Holtz mask. I changed the color of the image to sepia. I then added just a bit of color to the eyes, hair and lips using distress ink. I also added color to the edge of the image using distress ink. This beautiful scroll comes as part of the Baby Jesus set which is available at Sugar Creek Hollow. I used a Tim Holtz mask to mask a crown on the music and then used distress ink to color the remainder of the paper. Go visit the rest of the design team's blogs. 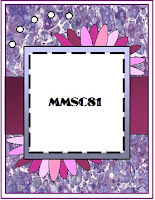 They have created some gorgeous cards using this set! I used a blend of Copics and Distress Inks to color Willow With Cookies. I have found it is actually easier to color this image with distress inks because of the detail. But, I still like the blend. I stamped the sentiment on a piece of the DP, then mounted it to a Tim Holtz Ideology fragment. 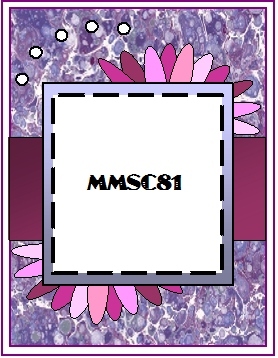 I then mounted that onto an altered Spellbinders Fancy Tag. I have had these Christmas buttons for a while, and loved them with this image I needed to tone down the color, so colored the buttons with W7 Copics. Here is a closeup of my flowers. 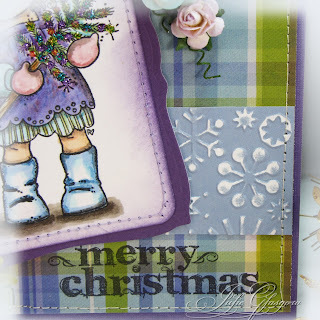 7 Kids College Fund has some wonderful Christmas stamps, from Magnolia's to Whiff of Joy. With Christmas right around the corner, go to 7 Kids College Fund to get your Christmas card supplies. 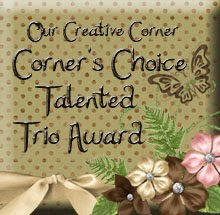 Accessories: Country Crinkle ribbon, Stickles, Grungeboard, crown brad (The Paper Studio), Lace, Rock Candy Crackle Paint, flowers. 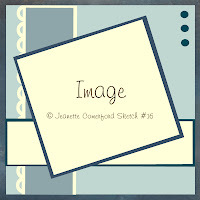 I doubled up my images in Photoshop and printed on white cardstock. The aging effect is created with distress ink and Rock Candy Crackle Paint. I used some Crinkle Ribbon, made into a bow and tied together. I used brown alcohol ink to color my silver crown which really gave a cool effect, and then attached the brad to the ribbon. I colored the grungeboard with Broken China Distress Ink, covered it with Rock Candy Crackle Paint, and then after the paint dried, went over it with Walnut Distress Ink. I then covered it with blue Stickles. It ended up having a shade of green, but was colored with blue and brown. Go figure. 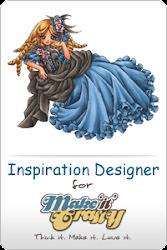 I hope you will visit all the designer's blogs today. Their cards are stunning! And go visit Sugar Creek Hollow for some wonderful, vintage Christmas Stamps. 7 Kids College Fund Challenge #8 - Give Thanks! 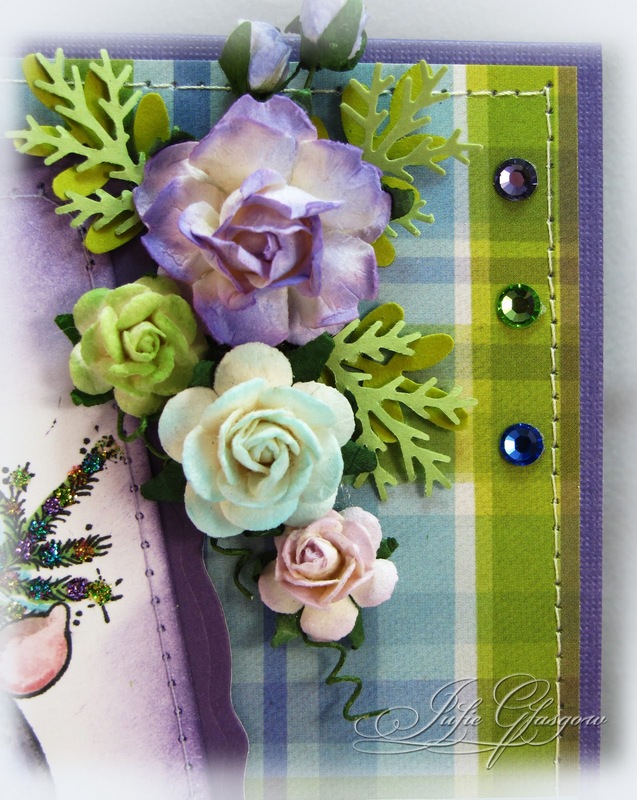 Sugar Creek Hollow - A Sketch and a Blog Hop!